I love this bread. It’s definitely a bread meant for soup, butter, honey, a fried egg on top – something it can soak up. 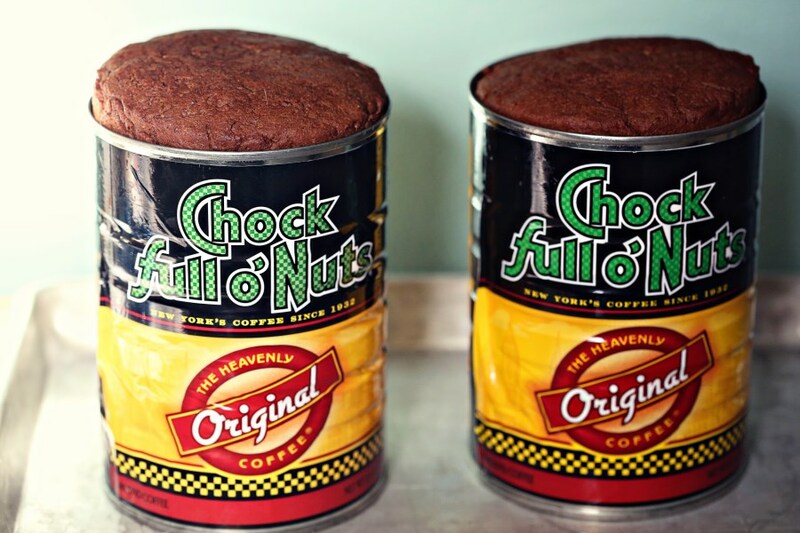 It’s dense, smells like gingerbread and it bakes in an old coffee can. How much more nostalgic or delightful can this get? We first made this recipe to accompany homemade clam chowder. Both recipes came out of arguably the best issue of Bon Appetit in years – the November 2012 issue. That issue had several recipes we’ve made countless times, AND an interview with Nick Offerman, a.k.a Ron Swanson. Best issue ever. 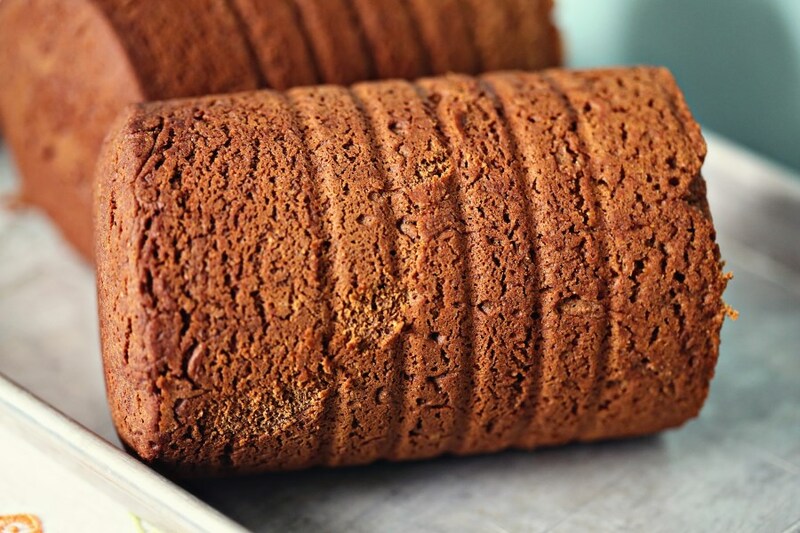 This is called Boston Brown Bread. It’s a classic recipe in New England and is typically made to go with clam chowder. I love that it makes two loaves. I can freeze one right out of the oven, or give it away. I think this time, it will travel with us this weekend to go see our friends, Matt and Anna in Dallas, who JUST found out they are having a baby GIRL in January. We are so excited to go spend some time with our culinary soul mates and best friends. So, call your nearest neighbor who you might suspect keeps everything and ask if they have any old coffee cans you can use. I did exactly that with my friend, Ann, and she delivered. 🙂 One more thing that makes me happy when I make this bread – I think of Ann! Have a wonderful weekend and bake something memorable! Preheat oven to 350F. Cut two 6″ squares of foil. Coat insides of the cans and one side of each piece of foil with butter. Stir milk and brown sugar and salt in a small saucepan over low heat until sugar dissolves and mixture is just warmed (don’t boil). Whisk whole wheat flour and the remaining ingredients in a large bowl. Add milk mixture, whisking until smooth. Divide batter between cans and smooth tops. (note! if the cans still have a lip rim, simply take your can opener to the top and it will cut that lip right off). 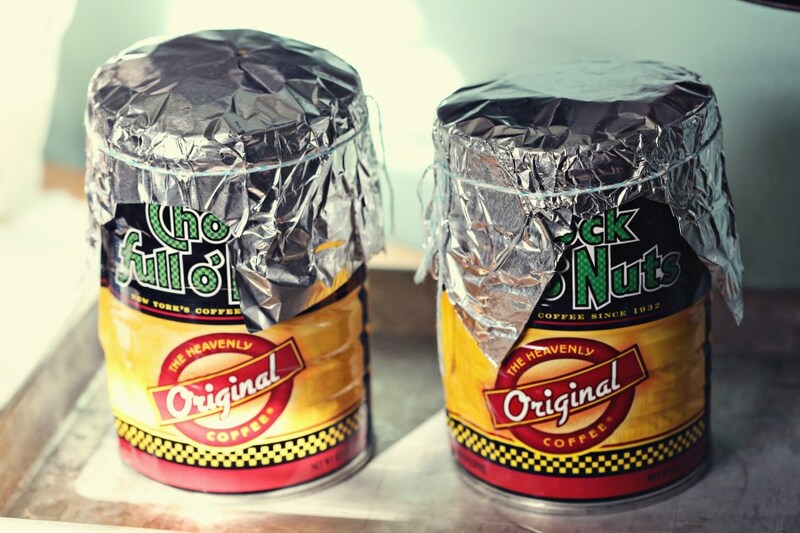 Cover cans with foil, butter side down. Secure foil with kitchen twine. Place cans foil side up in a deep roasting pan or heavy, shallow pot. Pour very hot water into pan to come about 2-3″ up the side of the cans. Bake until a skewer inserted through the foil into the center of each loaf comes out clean, about 1.5 hours. Transfer to a wire rack and let cool for 10 minutes. Run a thin knife around the edges of the cans. invert to release loaves onto a cooling rack. Let cool for 20 minutes before slicing. Serve with soft, salted butter and rejoice. 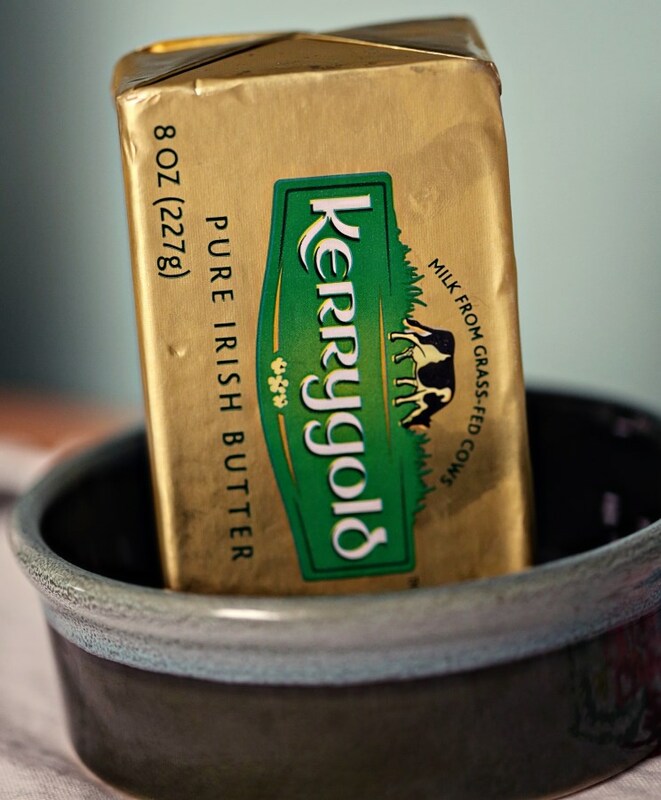 This is great salted butter. We buy unsalted for baking, but for eating, salted is the way to go! 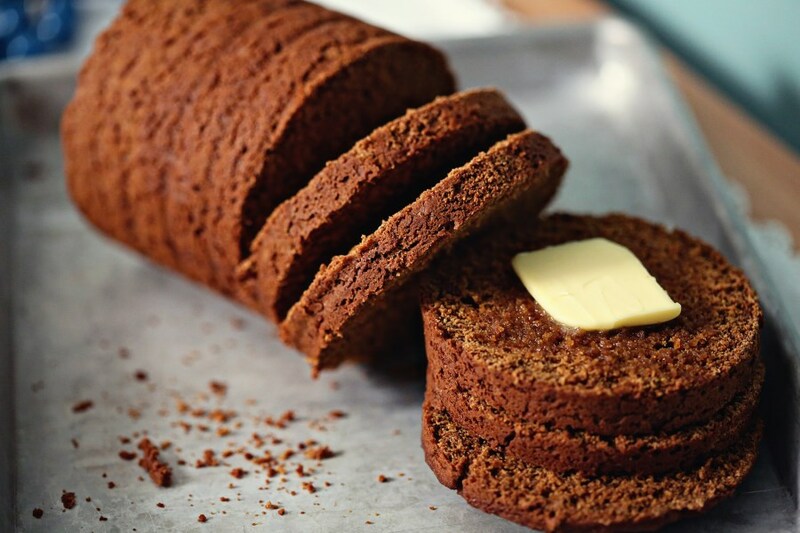 This entry was posted in Baked Goods, Breads, Butter, Hearty, Weekend Fare and tagged boston bread, bread made in a coffee can, brown bread, coffee can bread, Irish butter, molasses bread, rye bread, whole wheat bread. Bookmark the permalink. Alisa,, my grandmothers recipe is virtually same with the addition of chopped dates or raisens if no dates were handy. We sliced and spread it with cream cheese while still warm. I often pack it as a snack, making little round sandwiches of brown bread and cream cheese, to take while traveling. Great with a cup of coffee! Your post brought back many memories. Sometimes we would use soup cans too make small loaves as gifts. I love reading your blogs. I hope you inspire more people your age to cook and have a “family” meal. I fear itts a dying art! I am encouraged that your love of cooking, beautiful photography as well as your gift of words that allow the reader to experience food by just reading will make such an impression on your readers that they too will try new things! I love the soup can idea! I’m gonna start washing and saving mine. We like Brown Bread with cream cheese and sliced, green olives. Sounds weird, but give it a try.